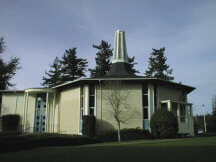 Last month I drove by Western Seminary in Portland Oregon where I studied in 1988 and got my introduction to postmodernism. I also drove by the Horse Brass Pub where I ate lunch every day. The Horse Brass has become quite well known now with Don Miller talking about it so much (Get PDF) but back then it was just an English style pub and a much better alternative to the Seminary’s cafeteria. Bob Hyatt (another Western Seminary student) also prefers the Horse Brass. Bob is a leader in the emerging church but doesn’t like the term. He prefers “organic church”, or so he said at our pizza party in Portland. Speaking of organic church, one of the teachers who has greatly influenced the house church movement is George Patterson who also teaches at Western Seminary. George yelled at me in the early 90’s when he found out I was starting things OTHER than churches. Dang! I like the guy. Despite his grouchy-old-man personna. He let me go through his files which were later published as the Church Multiplication Guide – one of the only resources for house church training in the nineties and much appreciated when we were doing house church in 1997. Did I start off saying the “P” word? I hesitate to use the word “postmodern” because the conversation belongs to a different decade, and I hardly ever use the word anymore, but it was 1988 when I became a full time student at Western Conservative Baptist Seminary and so its appropriate to bring it up now. That was my introduction to postmodernism and some concepts that were relevant to my course of studies. In Cross Cultural Communication, with Dr Donald Smith, we studied communication theory and the anthropology of Paul Hiebert. Hiebert is a professor at TEDS (Trinity Evangelical Divinity School) whose book Cultural Anthropology was the main text for our course. Cultural Anthropology is a fascinating subject. It is influenced by the thought of Claude Levi-Strauss who was influenced by Ferdinand de Saussure, the Swiss linguist who laid the foundation for postmodern thought during the 20th Century. Anyway, regardless of the many connections between Saussure and Strauss and Hierbert, we were rightly instructed that communication happens when people hear and understand the gospel, and not when we speak it. Communication is therefore “creating understanding.” This was a huge breakthrough for me. Hiebert had some thoughts on ‘bounded sets’ and ‘centered sets’ that also impacted me. And not just me. But over the years, this thinking would impact the entire emerging church. NextReformation have done a good job in laying out this teaching and its connection to emerging church and the teachings of Frost and Hirsch. Doug Pagitt and I were chatting last month on these models. Doug offered a third alternative – a “networked set” with a more distributed structure. This model has Christ located in his body as well as a distant point and will probably challenge the previous two models of bounded and centered. A visiting speaker at Western named JP Moreland spoke to us on apologetics. He told us that the leading thinkers of the first century were often the followers of Christ. The challenge was to be the critical philosophical thinkers in today’s world. Good challenge. JP has been putting out books on postmodernism. I haven’t read any of them yet. I think his understanding of postmodernism is the more the Derridian deconstructionism and epistemological questions of truth rather than the more cultural understanding of postmodernity that i carry. Heck – I might be wrong . .. but I am sure even JP Moreland lives in a postmodern world and goes home each night listening to postmodern music in his postmodern car to a post-modern house with postmodern architecture and styling. My world of modern-colonial missions ended in 1991 and a new world started. I wish there was a better word for it than “post-modern” (meaning AFTER the period of cultural modernity) but I just cant think of one. Another visiting speaker was researcher George Barna who has recently published a book called Revolution. I helped George get back to the Portland airport that day – nice guy – and I am soooo glad he has finally set his sights on the emerging church. Lamin Sanneh spoke to us about Africa. I got hooked on the idea of non-western theologians and have made a special effort to find their teachings ever since. Dr. J. Carl Laney taught Old Testament. His teaching on the book of Job later inspired an article I wrote in 2002 called “Postmodernism and Global Worldviews”, part of the Skinny on Postmodernity Series for The Ooze. Dr Mary Wilder taught History of Missions. We share the same birthday – September 7. But her birthday happened a long time before mine. A long . . long . . time before. Dr Wilder told me where the boyhood home of martyred missionary Jim Elliot was located. Jim used to pray on Mt Tabor, where he lived. I also used to walk up Mt Tabor to pray over Portland. I did that almost every day I was at Western Seminary. There are places on that mountain where i used to pray for the same things each day. It was a labyrinth or prayer path for me. I wanted to walk up and pray there again but didn’t have time. Anyway, back to the subject. Dr Wilder’s course was excellent. I was attracted to the monastic movements that made up most of missions history. My evangelical background was biased against anything Catholic, but this course helped me to see the bigger picture of what God had been doing over the last 1500 years. Dr Gerry Breshears never taught me but my friend Paul Jackson speaks highly of him. Paul pastors Glenwood Community Church where I was on staff for a few years as their Outreach Pastor. Great church! So Gerry gave a talk recently (hear the MP3) where he gave a critical view of the emerging church. Although he spent all his time critiquing Brian McLaren’s book “A New Kind of Christian” which he believes is the “systematic theology of Emergent”. I think if Dr Breshears knew how many Western Seminary students are starting and leading emerging churches around the world, then he might give a bit more space in his definition and critique of Emerging Church. Same for D.A. Carson (from TEDS – same seminary as Hiebert) whose students seem to do quite well leading emerging churches. Multnomah Bible School is down the road from Western. I also studied there. They were behind some incredible initiatives for Portland such as a strategic project called Mission Portland and an ecumenical prayer movement among pastors and ministry leaders. Western Seminary was too stodgy to do such things back in the late 80’s when i was there. But things have changed. I have heard on the grapevine that Multnomah has stopped supporting these missional projects in favor of focusing on their academic credentials. And Western have picked up what Multnomah has dropped. If thats true, I would bet that Western Seminary will be a better environment to study than Multnomah. And if Western keeps attracting emerging church leaders, then it might become one of the best places to study in USA. Lets wait and see. I did the MA in Exegetical theology, finishing in 97 before heading to the Netherlands for 2 years, and then came back to work on an MA in Counseling in 2001. I almost finished that before getting sidetracked by this little adventure God has us on (marriage, baby, church planting). And we’re at the Brass on Monday nights at 7pm. Ya’ll should drop by for a Gorby’s and a Scotch Egg. i didnt mention mark driscoll, mainly because once we were talking about western seminary and he said he didnt have a really good experience there. I think he said he was basically “kicked out” but you would have to ask him about that. ooops. well . .. . just forget that last comment. I am sure he was a fine upstanding student during his [attempted] studies at Western. And anyway – his church rocks and he has done really well . .. despite any hiccups with his seminary training. For the record, my money ran out and I stopped studying at Fuller, I was not able to get student loans, being a foreigner, and did not want to put it on the plastic. Thanks for the perspectives on Western. I read your blog for insights on lots of things. Didn’t figure I’d be seeing this. Mark Driscoll did have a tough time at our Seattle extension. But when he came to Portland he had a super time. He and I became good friends in the process. We’ve done some partnering and there’s more to come. Interesting to see where that leads now. The talk you linked was specific to Brian McLaren and my assessment of his theology. Emergent is a far wider phenomena. Impossible to cast in any mold. There are super examples. There are ones that are pushing the theological limits way to far. As I see it there are three essentials for effective church: confession, relation and mission. We have to confess the theological basics the church as always affirmed in various forms: unique authority of Bible, Trinity, Jesus as personal incarnation of God, substitutionary atonement, bodily resurrection, future judgment and so on. We have to have a life changing experience of entering into relationship with God through Jesus. He is the only way to the Father, but there are many ways to Jesus. Life in the Spirit will mean a whole new set of loves. Finally, we have to join in the mission of Jesus to reach out to lost and hurting people with this new life. Traditional church as gotten too much into confession and lost mission. Emergent has corrected this, happily. But some emergent churches have gotten so excited about mission that they have lost confession. All of us try to get our balance right and our service excited because of joining Jesus. And He smiles . . .
Don’t know if you’ll see this, and it might be better discussed here, but…A question- since the Bible (I think I learned this in your theology class at Western) gives us a many-faceted view of the atonement, speaking of Christ’s death on the cross as a ransom, a victory, a model, a cleansing and covering, and a substitute… why is substitute the only one on the list? Shouldn’t we be pursuing a comprehensive view of the atonement rather than valuing one facet over all the others? Ooooh, no good representation for George Fox Evangelical Seminary, where Leonard Sweet teaches and Brian McLaren recently frequented – ouch. 🙂 I just heard that they’re going to approve a program that’s a more “practical” degree – something to give folks seminary training but who plan on being supported not-monetarily by the church: that’s something I could get behind. I’ve heard a lot of talk about the wonderful experiences folks have had at seminary, and others have encouraged me to enroll; but the mere thought gives me the willies. I don’t know why, but I get the sense that that’s the least-likely place to foster and encourage my God-placed calling. A course here and there: yes; but a full-fledged degree? Negatory. Maybe I’m getting my Quaker on; maybe it’s the genetically-derived obstinance; maybe it’s the taste left in my mouth after interacting with a lot of seminary folks who seemed to go there for the wrong reasons. Did y’all ever feel like you had to jump through hoops? Did you feel like you encountered God, or rather encountered learning more about God? I hope I’m not causing any defensiveness: they’re just some honest questions. To be honest, I loved seminary… not because it prepared me to pastor- it was very… uh… unpractical. But because it prepared me. It was a very valuable, key part of God forming and shaping me. Which I suppose prepared me for ministry/to pastor. I know this- In the postmodern context (I can still say “postmodern” right? ), my seminary training was/is the grounding that lets me deal with/interact with culture and those I encounter there without floating off into some very weird places. As I work with young(er) pastors and future planters (guys like my associate pastor) I know I’m going to do everything I can to see them get through seminary. Churches should be paying for it! always good experiences for me. but i went for preparation and not a degree – never actually got my degree. when i first attended bible college in australia (WABC), i didnt realize they even gave a degree. for me, it was about the mentors and teachers. if you want to learn something from someone, you pay any price to go to them and get it. those people may be teaching at a seminary or they may not. Ah – you both sound like my kind of boys. 🙂 Thanks for the input. Why only substitutionary atonement on the list of essentials when I strongly believe in a multifacted view of atonement? Partly because it’s a short list and because it’s the “must have” stuff. This the aspect that gets attacked. So it becomes a place where if you have it you are in the camp, but if you deny it, you are going places away from the Bible. It’s also a place where the defensive folk hit on, unfortunately. They are looking for certain words or become exclusive on this point. The shrillness of their stuff is quite offensive. BTW, Western is inaugurating a “mission and culture” track in our MA in Specialized Ministry. It’s designed for folk who are working in the emergent type churches. Pretty exciting. confession, relation and mission – excellent stuff! i think the link to that program is here – look forward to seeing how the new track works out. Hey there. I wonder, since these posts were all made three years ago, if anyone will respond. I’m considering taking on the graduate certificate program at Western but I fear I might be a tad bit too liberal for the campus. I know next to nothing about it other than I woke up this morning thinking about going. Happy Friday. I see God calling a lot of people to study at a place they would not normally choose. me included. keep listening.